You too can get a free decoration here!!!!!!!!!!!! Though, you've already declared that it probably doesn't matter, I think many of the questions were such that I'd have taken different decisions as an administrator as compared to what I marked as a simple civilian. Plus, some questions were such that baseline prosperity level of the population in question (which wasn't mentioned in the questions), would influence our decisions. The prime example I remember is of whether taxpayers' money should be used to build museums, etc., which don't add any commercial value. The Kaptcha speaketh - "ackallus"
i got it (after seein one in ketan's blog.) but couldnt find the link which gave u permission to display it on blog..just found the pay for certificate link. so didn't display.. I have no idea. Nor airtel or whatever. Mobile really lost. Many months back. 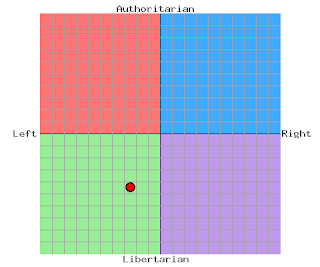 //But I'm a bit more authoritarian. This planet has – or rather had – a problem, which was this: most of the people on it were unhappy for pretty much of the time. Many solutions were suggested for this problem, but most of these were largely concerned with the movements of small green pieces of paper, which is odd because on the whole it wasn’t the small green pieces of paper that were unhappy." What looks like a dot in plan view (top view) can be any height in elevation view (side view)! Ummm, just rght click on the image on your results page and do a 'save image as' or whatever equivaent option your browser provides! BTW, the only few bloggers at whose site I saw such results, they all fell in the 3rd quadrant. So not so very interesting. Guess you should also fall somewhere around that if you try? I'd actually typed a response to your comment. Must've lost it before posting. So anyway, I thought you should be more surprised to see me on 'the' left for being Ayn Rand fan, rather than for being authoritarian. I think probably the web site describes her as liberal rightist. Anyway, not sure. From that passage, looks like Douglas Beams was an anarchist! That's extreme form of libertarianism, looks like. ;) So if he would want people to exercise freedom in the market, he would be a rightist, but from his writing looks like, without getting into 'the race.' ;) I don't think Ayn Rand must have interacted with Adams. One of the problems with Rand was, she'd no sense of humor!! Really. Uncyclopedia has an article by her name, in which they call her a robot in brackets! ;) TC. Abbey Douglas ko Beams bola? Yeh toh Insulate hai! T9? Phod dalo! Anyways, I have read only Fountainhead. I find many of her ideas, very appealing and natural and inherent in every being (Of course she would baulk on reading the above) ,but also find her a little monstrous and illogical sometimes. I mean, how foolish is it to simply blow up a building, just for sake of 'arts and originality' sake. Surely a right wing free market propagator would be horrified. Everything is a resource. I would appreciate if it were for sake of dramatic fiction. But Mr. Roark here is supposed to be entirely 'as one should be' :P I guess he is just being a regular vindictive childish avenger? Though I have not read Atlas thingie, I heard in it the hero is ok with blowing up whole train full of live people just because they were unoriginal little maggots or something. I think she is not really an 'libertarian' or 'anarchist' really. Maybe she would pick a Cabinet of Roarks (and Galts?) to rule and insubordinate the other vermin. BTW Adams was a "radical atheist" in his own words. BTW read all his books. I can send online versions if you want! Of course, now I better stop raising your expectations, or you will not enjoy the actual books out of over-expectation! Well Stupidosaur, the reason I like her writing so much is her writing at least dwelt on the issues most intimate to a human. My standard to compare her writin against was the likes of Sheldon, Dan Brown, Ken Follet, Erich Segal, etc. You might of course wonder, of all the above, maybe only Erich Segal somewhat had dealt with human emotions and thought processes with any degree of detailing. And maybe, that's why I admire Ayn Rand - for being able to create struggles in the plot without overt violence and yet for being able to put so much at stake for the protagonists concerned. I think she had clearly mentioned in the preface that she never considered her books as templates to moral decision-making. She just dreamt that there be such superheroes. And by labeling them as such, she probably made it adequately clear, that she could never be as good as them! Well the thing is, ONLY BECAUSE there are no gravity-defying stunts or supernatural events in the novel, many, many readers tend to think that FH was realistic. But that truly is not the case. So, FH is indeed dramatic fiction. :) Only that it is physically not violent. As I said before, Roark's acts are not to be taken as templates. What Rand has done in her novels is to make the greys of people's thoughts and tendencies, more of white or black. So what she approves of is only the thought processes (the whites or the blacks), but never the characters' actions (which in the novels are whites and blacks, but in real life, are bound to be results of moderated, i.e., grey thoughts). I don't remember specifically, the hero wanting to blow up a whole train. There was one side-kick, who used to blow up ships, but only after completely evacuating all humans out of it. In fact, if you'll read Rand's ideas well, she was staunchly against any kind of physical violence. ...She might have become inherently very resentful of the idea of 'unearned guilt' as she calls it (the default obligation put on every human by the society to 'do good' to others, irrespective of whether others deserve that 'good' or not), and needless sacrifice. And if you'll look around, her analysis of human psyche, especially, the collective (sociological) psyche is very accurate. How does otherwise one explain fasting during day-time and feasting during night time, considered as virtues? Or the idea that to please gods, one must suffer from pain? So in my opinion, she was very accurate in pointing out that some manipulative elements in the society make simply seeking pleasure (even without harming others) a matter of guilt, and then go on to exploit that guilt to fulfill their ulterior motives. So this frustration she must have experienced in her communist native country, coupled with her latent gratefulness for the USA could've been largely responsible for the shaping of her ideas. Therein, you'll find one of the characters showing truly 'normal human' kind of frailties and compassion for a fellow human who he had come to respect. Plus, she makes a mention of how even something as 'unproductive' as acting or music or simply raising kids all fall in the purview of objectivism. But I don't know if my assessment of the situation is correct, but maybe, Douglas Adams only 'points out' the problems in those books without trying to come up with solutions. Not that I mind it, but somehow coming up with solutions is so difficult! It is possible that Adams might have been influenced by Rand's ideas, after all, she too was a strong atheist, and critical of religionists' attempts to keep people guilty and keeping them from enjoying life on Earth. just wondering if views are also decorations..and when it comes to action, people might not match it..(was reflecting on some of the questions in the quiz)...i had sent u a decoration but it could have gone down the spam drain..
do u have a post on adams? ?or the book?? P.S.- The captcha "blessess' me with spelling mistakes!! Well, I did notice it. But I am Stupid. Don't know what to say. League of the greats...Dalai Lama, Wise Donkey. //just wondering if views are also decorations..and when it comes to action, people might not match it..
Well, I am tempted to start some sagely rant like, "Oh yeah, woe be humanity! We are such hypocrites! Blah blah!" just for the heck of it. But then how would I know? I hold no view and do no action. Like the Dolphins. "For instance, on the planet Earth, man had always assumed that he was more intelligent than dolphins because he had achieved so much - the wheel, New York, wars and so on - whilst all the dolphins had ever done was muck about in the water having a good time. But conversely, the dolphins had always believed that they were far more intelligent than man - for precisely the same reasons." //i had sent u a decoration but it could have gone down the spam drain..
What decorations? I didn't recieve any. Even checked the spam drain. Maybe it decomposed in the drain? What was it? Also, I don't have any post on adams or his books. Don't read it. Its junk. And maybe you will think this is how DA writes. But no. This post is no way close. He writes brilliant. The hitchiker's series is a comedy sci-fi with all kinds of sarcasms and observations on humans and their ways, disguised through events happening with aliens and interplanatery and time travels and inanimate objects and whatnot. Good literal translation of "Stupid! Kaise Ho? ", of course typed with all excited excesses missing in the original Hindi sentence of mine above. Anyways, its no surprise that your word veri is 'blesses'. Google definitely does not generate 'random' alphabet sequences. There is some kind of AI algorithm(s) at work, that analyse the page, pick some part of it, and give related words with spelling mistakes. This comment section has seen stuff like religionists and Dalai Lama mentioned. Thanks for posting the above comment to WDM! Insert llama and donkey joke here. This was written within angular brackets, and got interpreted as some html tag(?) and didn't print. Hence the subsequent explanation of 'mockery' after that space. hmmm actually what i meant was the permission part, i had to email them and then get it displayed..
sent u the coffee award again..it might seem like nothing to many but from a coffee addict and obsessionist, its something..
on dolphins, i read somewhere they are the only creatures who don't attack back..
btw simpler and shorter than adams, the animal farm and my fav, benji donkee of course..